Check out this emegency water filtereing gadget, called the iStraw. 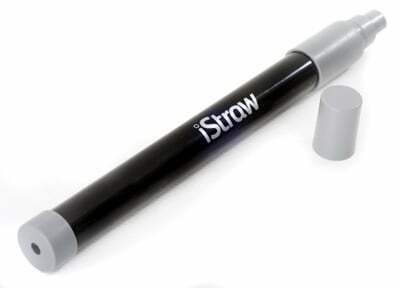 iStraw is a polycarbonate straw fitted with a special membrane, which uses micro-filtration technology to clean your water rather than expensive and bad tasting water cleaning tablets. It is suitable for personal use to help protect you, your family and friends against water borne bacteria and protozoa that are present in the drinking water and ice of many countries. In this day of extensive personal and business travel it is no wonder that many travellers often incur health problems during their holiday or business trip. The iStraw is compact, lightweight and simple to use, an essential companion for all travelers. Unlike water purification tablets, it leaves no funky aftertaste. It reduces up to 99.99999% of all waterborne bacteria, including Giardia and Cryptosporidium. When used properly, the iStraw is capable of filtering up to 500 litres of water. The iStraw is available to buy online for $49.99 from ThinkGeek.